On August of 2013, on the 18th, Kyle was engulfed, suddenly, in a fight for his life. An illness that we could not pronounce laid claim on him, and with a velocity and a determination that numbed us, he staggered…staggered….and descended far below the earth. He came to a standstill. Within four days those lungs, which had sustained him so well for 22 years, ceased to draw breath. His body became immobile; he travelled in labyrinths unknown, and not of his making. Fueled with morphine and Propofol, the acute phase of Guillain-Barré syndrome sought to do him in as he endured an induced coma. He waged his battle, traversing a twilighted landscape—jungles and deserts and high places, gunshot wounds, dark meeting places in rooms with no windows, ICU psychosis, and dimly lit passageways. A heart that used to beat at 58, now found its angle of repose at 120 and more. A muscled 185 pounder diminished to 125 pounds in short weeks. A body that could not sustain the basics of life, like blood pressure and a normal temperature. Oh! What we take for granted! The only message he provided us within those first three weeks was a delirious shaking of his head: back and forth, forth and back. Sitting in his room, that maniacal headshaking was woven into us. Sometimes, we just had to look away. Would he come back to us? And what parts might be lost forever? Four months in hospitals. And then a homecoming to SLO on December 23rd, and five months at home with us. And…many things came back. His mind and his humor (though these had never fully departed), his weight, his will. A couple dozen prescriptions became a dozen, a half dozen, and finally no doses of anything. He kicked it all—opiates, morphine, and finally methadone. Mobility returned, and dexterity. Many things were discarded: Hoyer lift, hospital bed, and his walker. The boy bears a couple of scars. A stoma from his tracheostomy. A unique puncture in his abdomen where a feeding tube sustained him. And what more? I cannot pretend to know. But maybe this: he came to know what we understand as suffering, but which “is really only life herself, making him unavoidably unique” (says Jim Harrison, in “Dalva”). Another nine month incubation under his belt, our beloved Kyle is reborn. Today he drove north, on a Path of Reclamation. 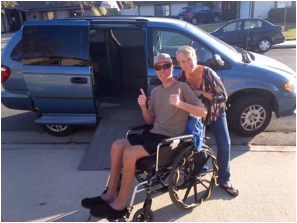 Armed with his Blue Rockers (braces), his hiking poles, his wheelchair, his Dodge and his dog, he is on his way.